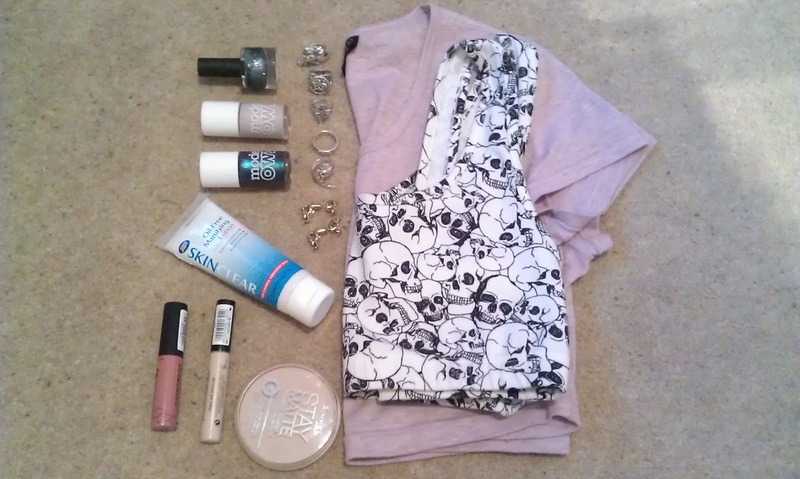 So I went shopping on Saturday with nothing in particular in mind, but ended up getting quite a few things. This is not my usual amount of spending, but I never really spent my birthday money, so I still have quite a large amount remaining. I went to topshop, and to my surprise, there was quite a large sale on (yay!). 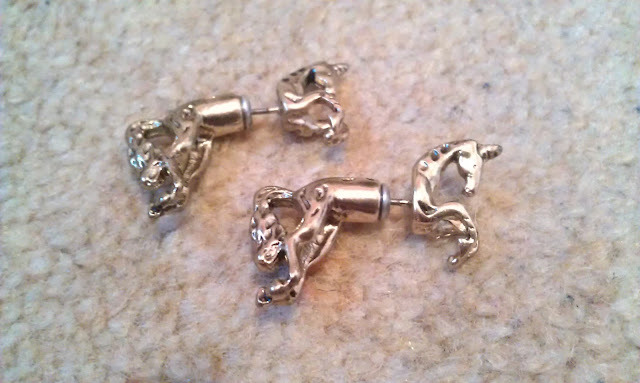 I was dissapointed by the clothes, but as always, they had some lovely jewellery. 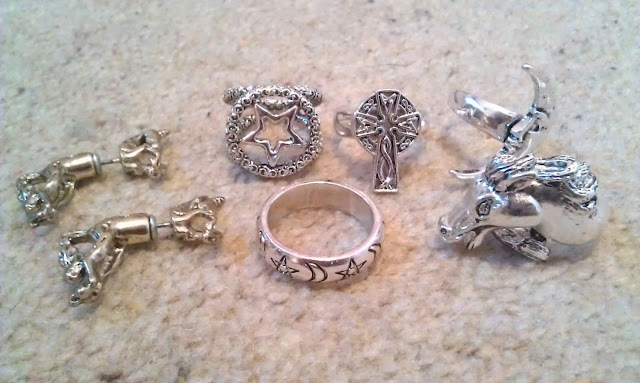 I bought 5 silver rings and a pair of gold unicorn earrings, all of which were reduced by 50%. The first 4 rings were part of a pack and were reduced to £8.25. 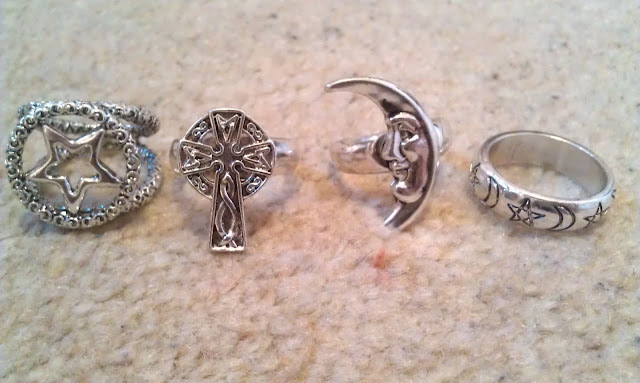 I love all of them except from the wired one with the star in the middle, but overall...a good buy. 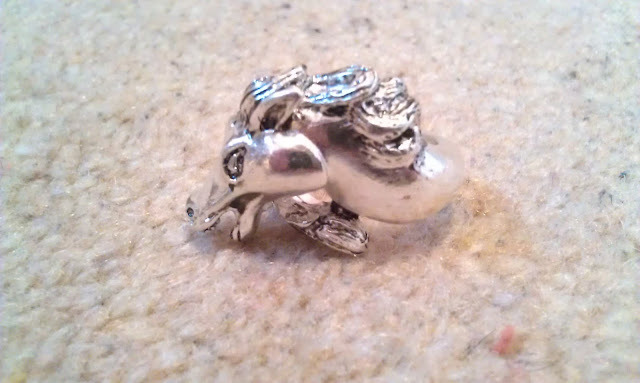 Then I bought this chunky horse head ring for around £3 and I love it already haha. 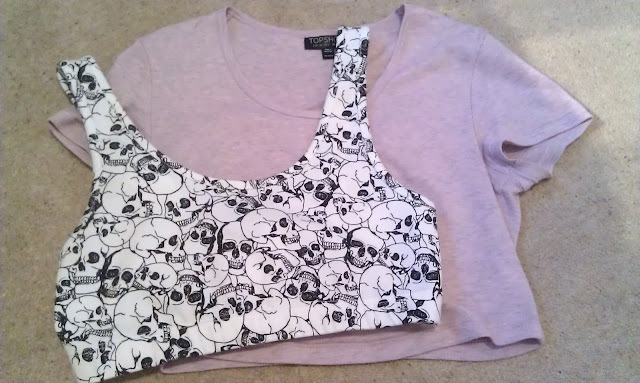 Once I got past the sale area, I went to have a look at the crop tops and ended up getting the oh so loved skull one(£12), and this cute pink t-shirt one(£8). I really like the fit of these, and I plan to wear them with high-waisted shorts/jeans so not too much belly is seen (I got both in a size 10). I also thought the prices were very reasonable for Topshop. 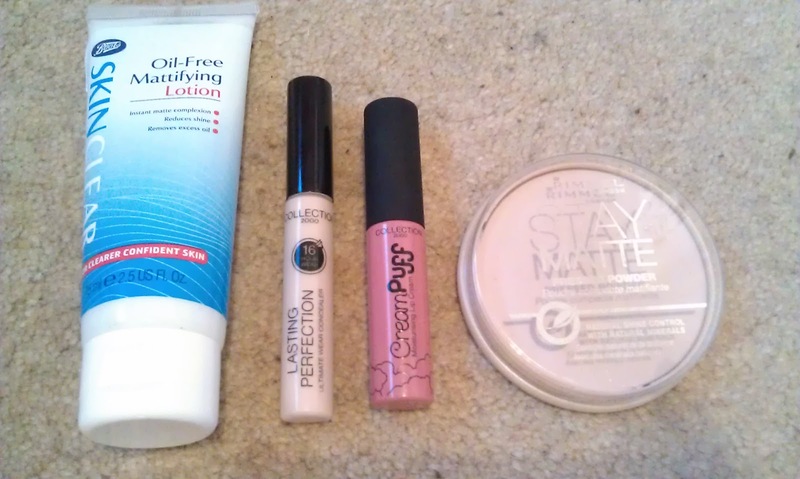 Next I went to boots and urban outfitters and got some beauty products, some of which I will probably do a review on with swatches etc. I was dissapointed to see the 3 for 2 wasn't on anymore, but that didn't stop me! 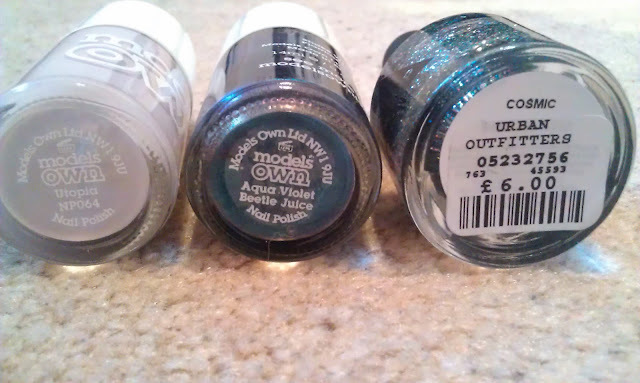 I got 3 nail varnishes, 2 from models own and 1 from UO - Utopia, Aqua Violet and Cosmic. 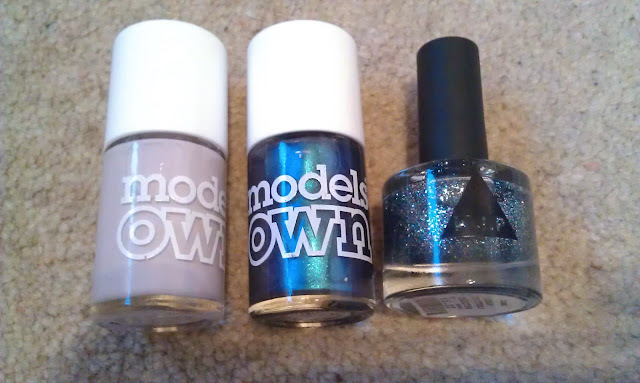 The models own nail varnishes were on 2 for £8, and I don't have any by them, so I couldn't resist. I tried them out as soon as I bought them and really liked the colours on. They dry fairly quickly which in my opinion is muy importante, however, they are not very opaque, and require about 3 coats to get full coverage. The urban outfitters one is brill(£6), and could be worn by itself or on top of another colour. Clear mascara by collection 2000(£1.99), boots mattifying lotion, collection 2000 cream puff lip cream in Cotton Candy 1(£2.99), Rimmel stay matte powder in 003(around £3), Collection 2000 lasting perfection concealer in Fair 1(around £3). And that is it! Have you bought anything nice recently? And would you like any reviews? :O Those rings are to die for, and that skull crop top is to die for! I'm so jealous!